The rankings haven't changed in RR11. With 7 games to go for each engine it would be highly unlikely that the top and bottom two engines will change in the last RR. The only undecided race is for 5th place. Andscacs with a very disappointing 1.5/7 score in the RR allowed Chiron to close the gap to only 0.5 points. Stockfish - Chiron: Chiron sacrificed a pawn to break Stockfish's center, then traded down to a QBN vs QBB position. The black king was completely exposed, Chiron thought the bishop pair gave some compensation but Stockfish's eval kept increasing. 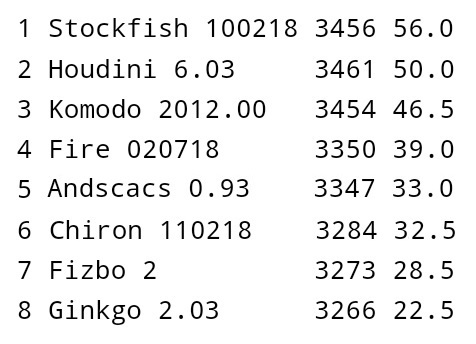 Stockfish traded down to an opposite color bishop ending, usually a draw but evals jumped over 2. Stockfish had a connected pair of passers that were unstoppable, Chiron realized this as well and the game was adjudicated before they actually moved. Fizbo - Andscacs: On move 20 Andscacs started a series of sacrifices and exchanges that resulted in a very unusual BBN vs R position on move 32, with Andscacs 4 pawns up. Fizbo's eval started to jump, Andscacs realized it was losing a few moves later. After exchanging pieces Fizbo had only a bishop and a single pawn left, but the pawn was protectable by the bishop while Andscacs' king couldn't protect its remaining pawns. Chiron - Andscacs: Chiron had an eval advantge from the start, evals approached 1 when it created an advanced central passer. Andscacs advanced its passer on the queen side, Chiron captured it on the 2nd rank. Andscacs then gave a rook for a bishop, and after a series of exchanges only RN vs NN were left. Chiron then captured a pawn and reduced to a winning knight ending. Two losses in a row for Andscacs, the gap to Chiron in 6th place is down to 1.5 points. Komodo - Andscacs: Komodo was down a pawn early in the game. Andscacs locked the center and had a weak king side. Komodo concenterated forces and advanced pawns on the king side, when it opened a file the attack on the king was deadly and the game was adjudicated quickly. Another Andscacs loss, Chiron is only 1 point behind. Stockfish - Fizbo: Stockfish had two strong knights in the center, which it traded in a pretty combination to get two pawns on the king side. Evals continued to increase, Fizbo got a pawn back but had to protect its exposed king. It gave its queen for two white rooks, leading to a QB vs RRB position with Stockfish up two pawns. A king side passer meant more material for Stockfish and another win. 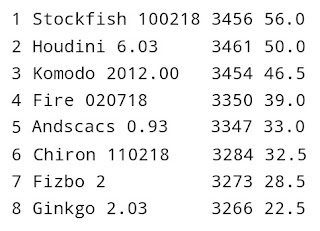 This is Stockfish's 10th win over Fizbo in 11 games, remarkable. Houdini - Ginkgo: Houdini had an eval advantage of over 1 in a RB vs RB position but Ginkgo held the draw. Fire - Komodo: In a closed position Fire was tempted to capture a pawn while opening files, one on each side. Komodo applied pressure with a queen side rook on the 2nd rank and attacked the king on the king side. Fire's defense collapsed and the game was adjudicated as it lost its queen for a rook. Houdini - Andscacs: Houdini had an eval advantage that stayed under 1 for more than 40 moves. Material was balanced, Andscacs' king was exposed in the corner with an open file that Houdini's pieces could use to make threats. On move 58 Houdini created a central passer and evals were over 1.5. After exchanging queens only RBN vs RBN were left, Houdini captured a pawn and created a second passer. Andscacs started to lose material and the game was adjudicated when it was a piece down. Ginkgo - Fizbo: Fizbo's eval was high early in the game, over 1.5, Ginkgo's eval was close to 0. Fizbo had more space but Ginkgo's position seemed solid. Fizbo gave a rook for a knight and opened the king side, and then evals started to jump. Fizbo traded down to a RN vs BN position, it was 2 pawns up with two king side advanced passers. Fizbo brought the king forward and captured another pawn to create a queen side passer. When the pawns started to march the game was adjudicated. Fire - Houdini: Evals were close to 0 as the engines exchanged pieces gradually. Fire was a pawn up with most pawns on the board and the engines started to shuffle from move 40. 45 moves later Fire opened the queen side with a knight for pawns sacrifice. Evals jumped to 1.5 as Fire's passers reached the 7th rank. Houdini gave a rook to get rid of the passers, leading to a QR vs QN position. Houdini's eval was signalling that it was lost, but Fire couldn't find the right moves and Houdini managed to reach a draw. After many early exchanges the game reached a RRB vs RRB position on move 27. A few moves later Fire captured a pawn and equalized the material. Each engine had a passer and the bishops were of opposite color, it was not clear why Stockfish's eval was over 1. Evals kept increasing slowly. After exchanging rooks and a pair of pawns, Stockfish brought the king forward. All its pieces active and centralized, Fire's pieces were mostly blocking and defending. Stockfish captured the black passer and pushed its own forward. Fire used its pieces to block the passer, allowing Stockfish to capture a second pawn, creating another passer on the queen side.